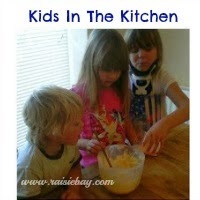 Hello and welcome to this weeks kids in the kitchen. Last week I was given a homemade jar of lemon marmalade and I was thinking of how I could use it in a cake. My favourite cake is Lemon Drizzle Cake and I know you can make Orange Marmalade Cake so I thought it would work with lemon marmalade too. The result was a sharp and tangy very moist cake. I added a drizzle of sweet icing which rounded off the flavour nicely. I asked who would like to help me bake a cake and the Little Man and Boo jumped to the task. I’m afraid Star still isn’t feeling her best, but I’m sure she’ll be up and cooking again soon. Last week just one person joined in with the Linky and that was the lovely Miss T from The Beesley Buzz who showed us how to make sausage rolls. Thanks for joining us and showing us that cooking can be tiring as well as fun, believe me, I’ve had quite a few tantrums in the kitchen. Do come and link up your posts too. We love to see people cooking with their children, it’s such a fun and important thing to learn. It’s not always easy, I know, sometimes I find myself wondering why on earth I do it, especially when it generally means twice as much mess for me to clean up. I can’t wait until they are big enough to clean up too! It is so worth it though, my kids are always willing to come and give me a hand in the kitchen now, and Boo aspires to be a chef when she’s older. Details for linking up at the end of the post, in the meantime please enjoy our Lemon Marmalade Cake. Make topping by warming up the lemon marmalade and spreading it on the top of the cake. When marmalade has cooled drizzle the icing over the top, leaving bits of marmalade showing through. The Little Man loves to crack the eggs and mix them. Boo is the best mixer! This sounds delicious! Just no time for baking with kiddies at the mo I'm afraid – got a whole heap of end of term cupcakes to do…. you should get the kids to make the cupcakes 🙂 I generally do cupcakes for the end of the term but I've opted out this year, I'll be baking enough for Boo's birthday party the last week of term!